An altar is a structure, usually religious in nature, on which different offerings and sacrifices are placed. It is a place where people communicate with and worship their gods. The altar’s original purpose in pre-Hispanic Latin America was for worshipping gods and conducting human sacrifice in exchange for fruitful crops; special altars were almost always constructed for the god of the sun. Many altars were built at the highest point of a building or structure and held great importance in designing Aztec cities. Eventually, the altar transitioned from being a non-Christian symbol to holding important status in the Christian church, where it occupies a prominent place within its confines. 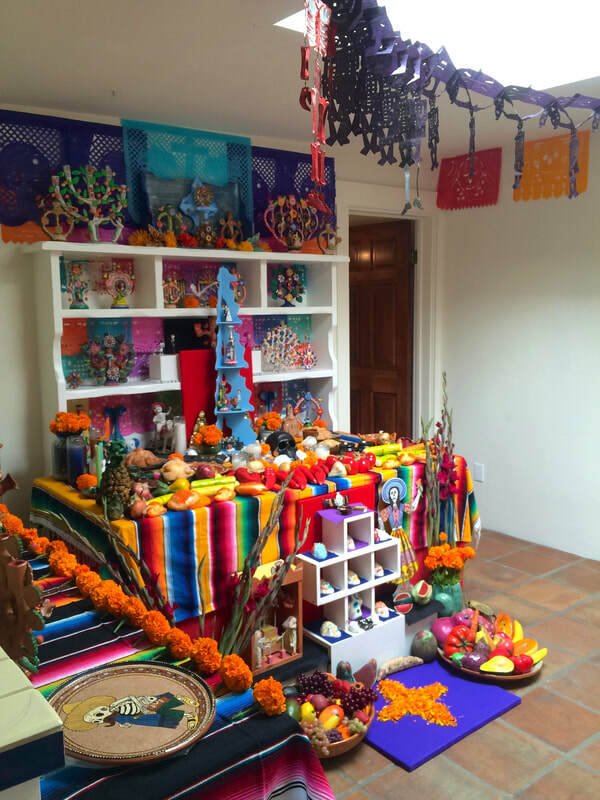 Many individuals build altars in their homes to worship patron saints, and most frequently, on the 1st and 2nd of November, (Day of the Dead), people construct altars to give offerings to the souls of their deceased ancestors. Un altar es una estructura religiosa, en lo cual ofrendas diferentes y sacrificios están puestos. Es un lugar donde la gente comunica y honra sus dioses. El propósito original del altar en prehispánico Latinoamérica era honrar los dioses y para el sacrificio humano en cambio por las cosecheas exitosas; altares especiales eran construidos para el dios del sol. Muchos altares eran hechos al punto más alto de los edificios o estructuras y tenían gran importancia en la diseña de las ciudades aztecas. Eventualmente, el altar transformaba de un símbolo que no era cristiano a tener una posición relativa in la iglesia cristiana donde ocupa un sitio principal. Muchas personas construyan altares en sus casas para honrar algunos santos, y con mucha frecuencia, el 1 y 2 de noviembre (Día de los muertos), la gente hace altares par dar ofrendas a las almas de los ancestros fallecidos.